I was intrigued after watching Peter Tichy’s video tutorial in which he recreates the interactive animation of this website. 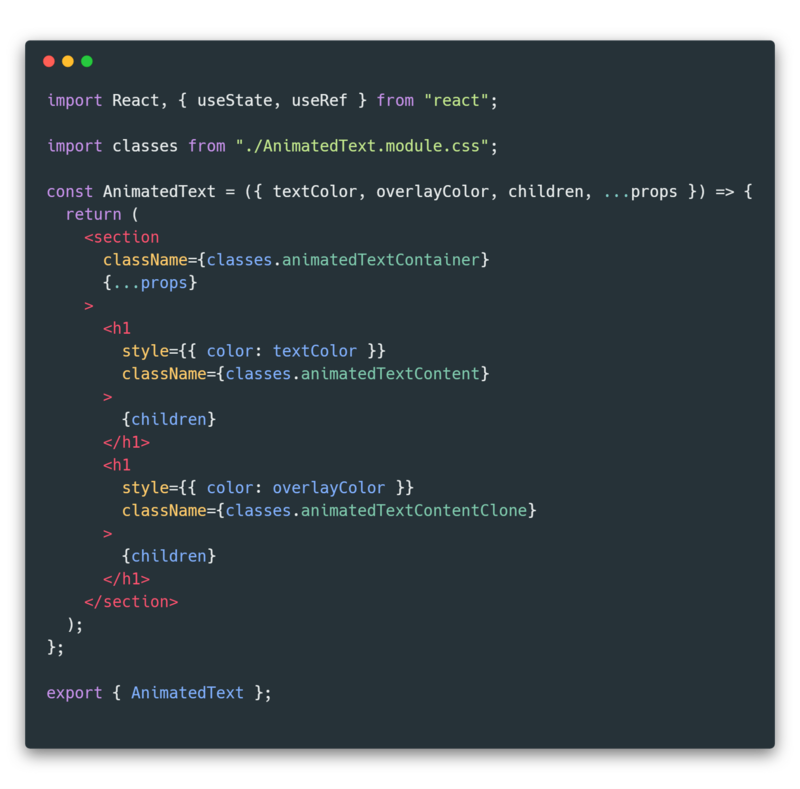 I decided to build the same but with the hot new tech like React Hooks, CSS custom properties, clip-path and CSS Modules. Building these small but complete UI pieces really helps in getting a good grasp of the tools without worrying about completing and maintaining large side-projects that will never see the light of the day. Disclaimer — Hooks are currently in preview mode. So we are free to experiment with them in new projects but there is no rush to refactor production code. 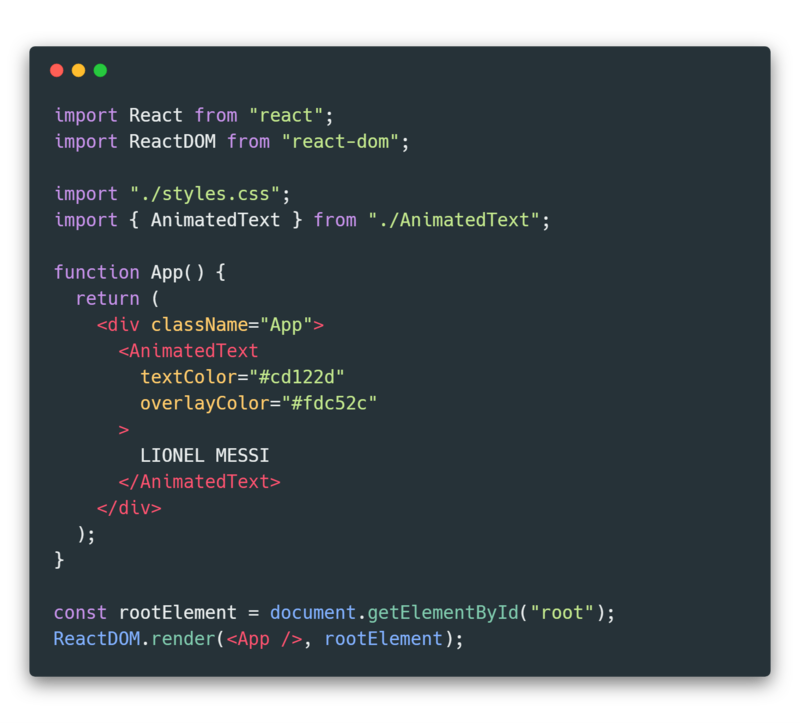 Use React v16.7.0-alpha and Create React App v2.0 for this tutorial. When mouse is hovered over Lionel Messi, some part of the text shines with yellow color. Although not used here, it’s recommended to manage your React components with Bit, to make them organized and reusable for you and your team. It will save a lot of time and work in your next app. Give it a try. Our React application will have a src/ directory where we will make all the code changes. The file structure will look like this. The index.js file is the entry point to our application. 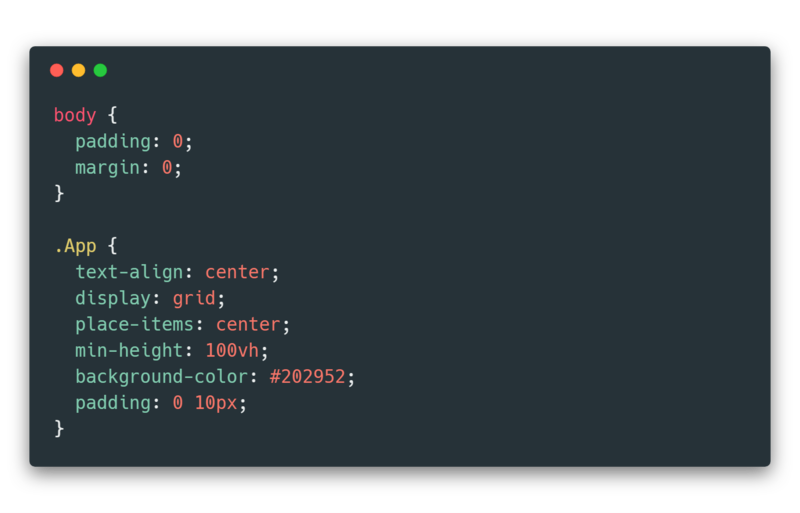 We have imported styles.css file and AnimatedText component. 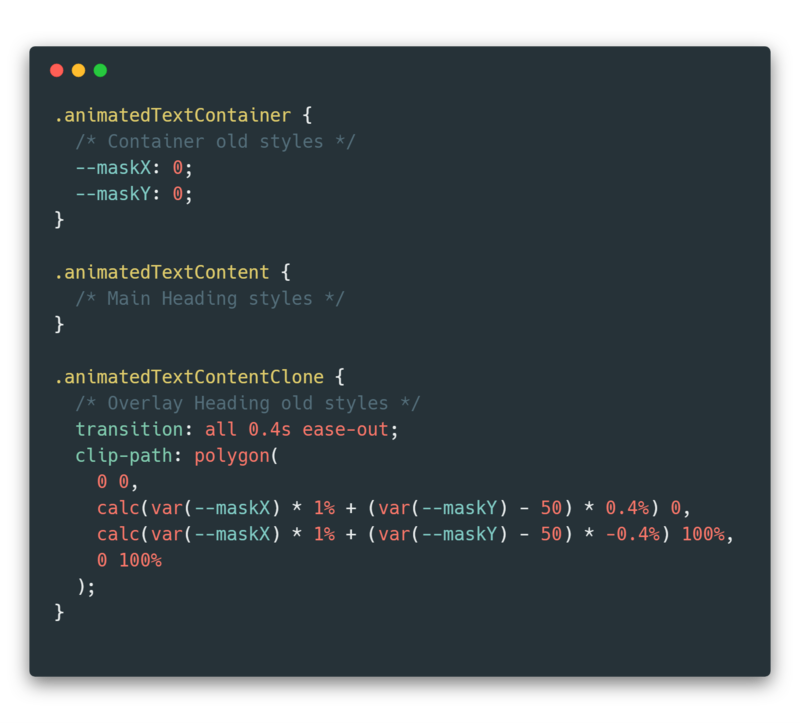 The styles.css file only contains a handful of style declarations mainly to reset the browser styles and center align everything on the page. The AnimatedText component uses three main props — textColor, overlayColor and children. 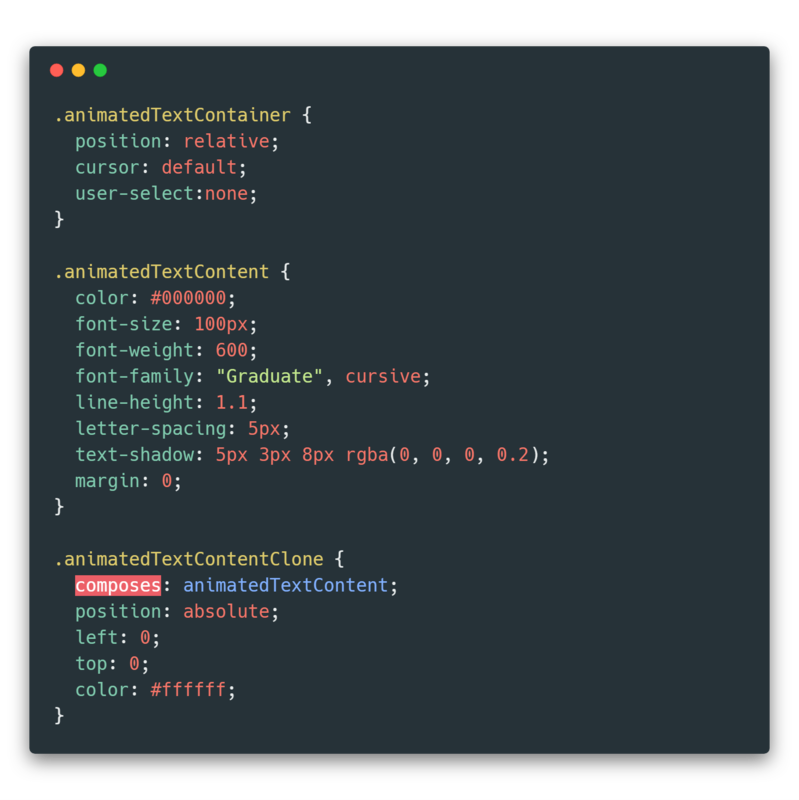 We import AnimatedText.module.css CSS Module and assign the corresponding classes to the elements. There are two headings, the second one will be styled to overlap the first one. With CSS Modules we can reuse all the declarations of one class in another with the help of composes keyword. That way we can ensure that both the headings have the same base styling. Then we add some more declarations in the second heading to make it an overlay. We can see that the first heading (red colored) is entirely hidden because the second heading (golden colored) completely overlaps it. Now, we’ll use clip-path to clip the second heading along a certain shape. The clip-path property is used to clip text to a specific shape. The value of clip-path property is copied from the website linked in the beginning. What it does is difficult to understand by just looking at code. So let’s check the result for certain values of maskX and maskY. We add onMouseMove and onMouseOut props to the the animated text container. The mouse move handler uses the state setter provided by the useState React Hook to set the mousePos to the new mouse position. 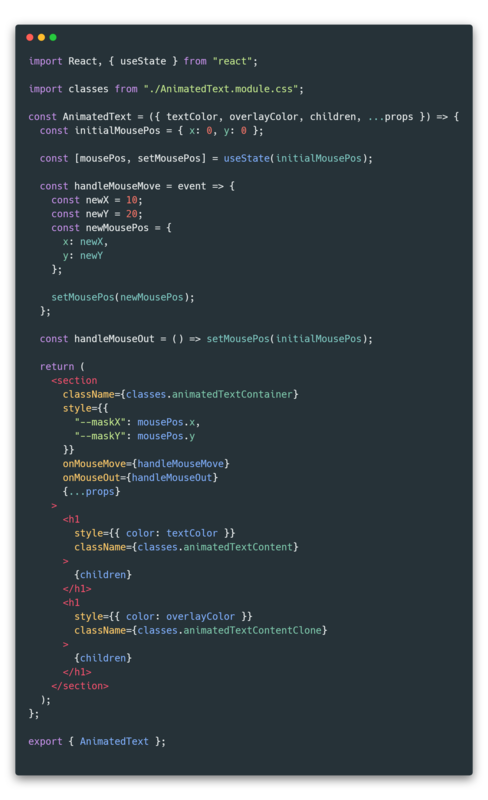 React then assigns the mousePos state to the maskX and maskY CSS variables. When the mouse leaves the container, handleMouseOut function resets the state to initialMousePos. The only thing left is to calculate the value of newX and newY. For that we will find the width of the animated text container and use it to find a percentage for newX and newY. The complete implementation of AnimatedText component will look like this. With that, we are done with the implementation of the Interactive Text Animation. The code is available in this codesandbox. Here are some useful hooks with Bit.